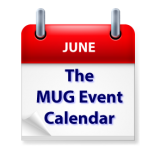 Apple’s WWDC announcements will be on the top of everyone Apple User Group’s agenda this week, but The MUG Event Calendar is stacked with other great topics too. Various capabilities, functions, and even dangers of the Cloud will be discussed at groups in New Zealand and at two different Virginia. Affinity Photo will be examined at a California group, while Apple’s Photos will be on the agenda in Australia and Wisconsin.